If you didn’t know we offer wedding services, consider this news. Mike Cherim, owner/guide, and Redline Guiding’s Chief Cook and Bottle Washer, is also a New Hampshire Justice of the Peace. Well, tonight we had conducted our first-ever service for locals Cindy and Edgar. Our first wedding! Such an incredible feeling being part of something so special. It wasn’t a mountain-top or wilderness wedding, yet it was just as special as any wedding could be and we’re proud to have made it so. Thank you for choosing Redline Guiding! 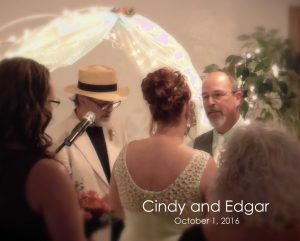 Cindy and Edgar.